In reply to Alison Ritchie's recent posting regarding the famous 30th February gravestone in the Cathedral graveyard (pic 3157), this photo should hopefully help you to locate the stone. I was in roughly the right area last time I went looking then... That circular pillar in the background should be a good guide. Printed out this photo and finally found the stone yesterday... I'd not been looking far enough up the graveyard. Great stuff Alison! I have had two seperate conversations with people over the last fortnight about the existence of this gravestone and both found it hard to believe. I was thinking I would have to go on a search myself, but now I know where to look to prove it is not just a story!! 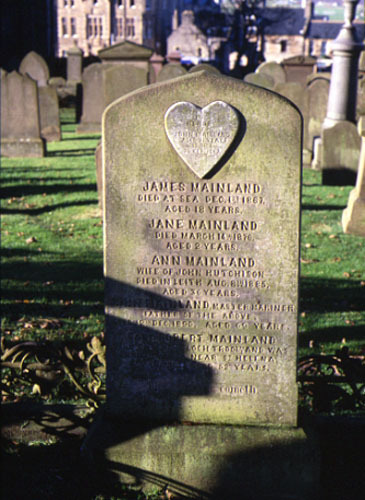 In memory of JOHN MAINLAND aged 31 who died 30th Feb 1887, JAMES MAINLAND died at sea Dec 1st 1867 aged 18 years, JANE MAINLAND died March 14th 1876 aged 2 years. ANN MAINLAND, wife of JOHN HUTCHISON, died in Leith Aug 9th 1885 aged 35 years. JOHN MAINLAND, Master Mariner, father of the above, died 12th Dec 1896 aged 69 years. Capt ROBERT MAINLAND died on ship "Loch Trool" and was buried at sea near St Helena 4th Jan 1905 aged 52 years. The morning cometh.